In Part 1 of this discussion we talked about the challenges of defending your budget in an atmosphere where the underlying belief is that “IT costs too much,” and how difficult it is have a “value” discussion with your customers if you are not talking the same language (services). We introduced the concept of a Service Value Chain and defining services as what you sell, and not what you do. In this article, we will focus on alignment of your services into a customer focused Service Portfolio that is based on a market approach (offering what your customers need). Understanding what you sell is critical in any discussion with your customers. Many organizations get stuck building complex Service Catalogs that have little relationship to how customers perceive IT services. These catalogs are designed to help the technical organizations manage their work (i.e. ; manage what they do), but provide very little in the way of connecting IT with customer perception of value. This is usually a result of an inside-out view of IT, where there is an internal technical focus and bias that is disconnected with what customers are actually consuming from IT. What is needed is an outside-in approach that marries the technical aspects of IT services with a market based approach that enables end-to-end services with a customer focus. Creating and communicating value is a discipline that starts with development of a Service Portfolio. This includes reaching out to your customers to understand service and value from their perspective (a market orientation). Customers in this context are the revenue producing organizations that fund your operation. They are the ones that often do not understand why IT costs so much. The Service Portfolio helps you to establish a market-based approach where you can begin to reorient the way you communicate value. Services your customers consume are likely bundles of technology products and services you already provide that are not fully developed into an end-to-end service offering. A common example of this is an onboarding service. There are many enabling services which support onboarding that are provided by different organizational functions (i.e. ; HR, Security, Facilities, Space Planning, IT Desktop, Mobile, Telecommunications, et al). Your customers want an onboarding service with an easy button. That means offering it to them as an end-to-end service where they don’t have to manage the complexities. And yes, this means you have to manage the complexity – but now you are providing a service that has direct value to them. Conversations about the cost of that service will have a much different meaning to the customer. Your Service Catalogs need to be organized into services you sell – not things you do. At the minimum, your catalogs should represent deliverables that can be translated into a unit of cost. Take a service like architectural consulting- this sounds like one of those things you do, and without clear deliverables it probably is. A better way to think of this service is to understand what the deliverables are; things like Assessments, Product Guides, and Road Maps are common. Each one of these has a discernible value that can be translated into a service offering with costs. 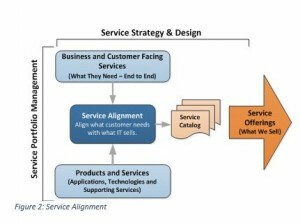 The Service Portfolio and associated Catalogs (Strategy and Design) are iterative. A market based approach requires regular adjustments. As your customers adjust their needs, you need to adjust your services. This becomes part of the investment planning activities (more on that later). A market based approach includes evaluation of outside suppliers. Benchmarking can be a valuable tool when talking to your customers and provides a proactive means of controlling Shadow IT. Many organizations have a real problem with Shadow IT. Businesses go where they can find the services they need, which likely means they are not finding the service internally, or they believe it costs too much. Transitioning to a service framework where you are actively selling your services will put you in a much better position to address this.